See this smokin' performance of Pete Wernick & FLEXIGRASS. Watch a Wernick Method class, and hear what the students and teacher say! Thanks Fred Boettger, for a fun 4-minute report. Video of a recent Jam Camp. Have a look inside one of Pete Wernick's Bluegrass Jam Camps. See how jam campers learn tried and true techniques for jamming starting from day one! Life, Bluegrass, and Dr. Banjo, News Feature Channel 9, Denver. 3-minute report shows Pete at his practice cabin and with FLEXIGRASS. Pete, Earl and Steve on Letterman! 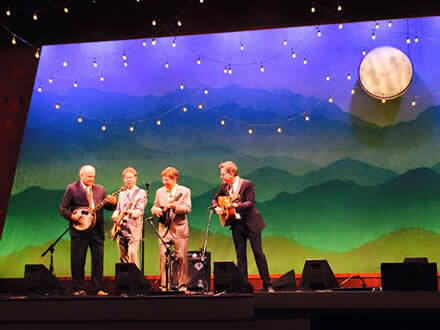 Men With Banjos (Who Know How to Use Them), in groundbreaking five-banjo "Foggy Mt. Breakdown" with Earl Scruggs and Steve Martin leading the way. With Hot Rize doing Radio Boogie (at 2:28), jamming with Steve Goodman (at 9:03), more! Pete discusses the new album, playing at Steve Martin's wedding, having his music played on Mars, Jerry Garcia and the origins of taping, and more! Pete teaching a student using the Loop Exercise Method. Pete talks about his musical start, shows a bit of clawhammer. Congratulations to J.D. a banjo pickin' PhD! Interview with Pete, Justin, and Jordan at the recent Bear Trap Festival in Wyoming. The guys talk about recording plans and how the band has evolved since forming as a "teenage supergroup". with Sierra Hull, the Gibson Brothers, Mike Witcher, Zeb and Samantha Snyder, Jacob Eller. The tune, Huckling the Berries, is one of Pete's earliest, from Country Cooking's 1971 album. Red Knuckles and the Trailblazers' strange adventures at the 2015 RockyGrass Festival are officially preserved in the mini-documentary, Night of the Living Red. "WHAT THE has our best versions of the best of our new material in the last few years. I'm really proud of how the band is sounding! I'm also quite tickled about Greg Carr's outrageous cover design (five panels worth!)" The new album spotlights Joan Wernick on vocals and features several Wernick originals, plus great takes on classics like Snowbird and Blackberry Blossom. From Pete and Joan's "Windy Mountain"
The shows are #311 and #442. From Hot Rize's "Traditional Ties"
From "Dr. Banjo Steps Out"
From Hot Rize + Red Knuckles & The Trailblazers' "In Concert"
Hear Pete on "Colorado Matters"
Pete picks banjo and talks about the new CD on KCFR Denver, with host Dan Meyers. Click here to listen.